One of the newer digital online magazines is "A Homespun Affair," which is published monthly. You can get a free subscription by following this LINK. In the August 2012 edition, you'll see that I was honored when my Independence Day card was chosen as winner of the July challenge! For this month's challenge, there's a color challenge (blue, red and taupe) as well as a challenge to re-imagine one of the projects shown by the AHA design team in the August issue. This project I designed to answer the color challenge. It's also a prelude to projects that I will feature this weekend on the "School is Cool" Blog Hop. This month's AHA magazine also features a unique twist on an explosion box design by Tiffany Simmons, which I do want to try. It served as inspiration for the "box" but I wanted the gable design for the roof. 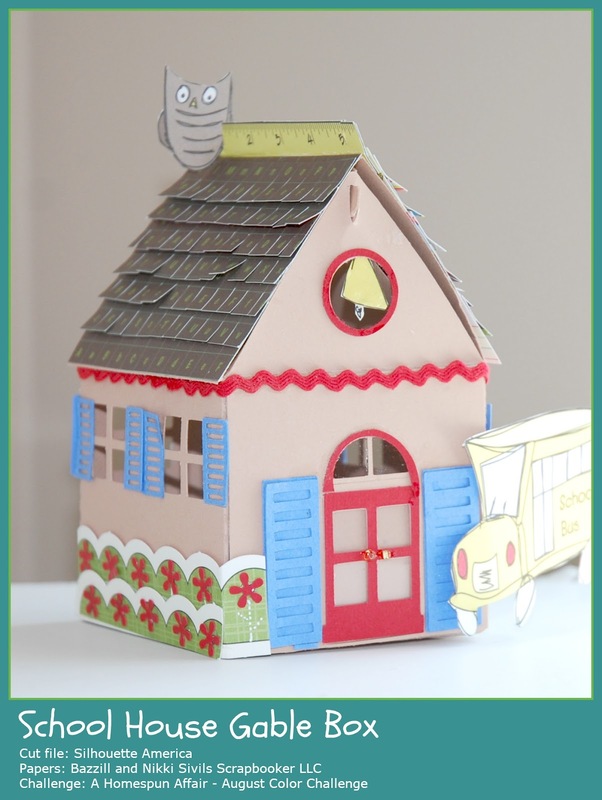 I found this cute house box pattern on Silhouette America, and used my Silhouette Cameo to cut the file. It was VERY quick and easy as you can see in the top left photo here. One piece, with scored fold lines, makes it easy to assemble. I then set about making the project my own, by changing up the one side (to make a door instead of all windows) and embellishing with cut pieces and paper. Stop back on Saturday and Sunday to see more companion pieces to this cute box! OMG Ellen!! I just love this gable box!! What a GREAT and creative make of a gable! Blown away!! <3 <3!!! I am really impressed by your gable box! It's awesome! Thank you so much for entering your project in the color challenge! Really super cute!!! Awesome job on that box. Thanks for entering the color challenge!